Straightening out my button box, I found this old belt buckle. I think it was from my grandmother. I found lots of little remembrances. It was nice strolling down memory lane this morning. This entry was posted on Sunday, August 23rd, 2009 at 3:00 am and is filed under Vintage. Tagged: Vintage. You can feed this entry. You can leave a response, or trackback from your own site. Ah, memories of my mother’s button box! 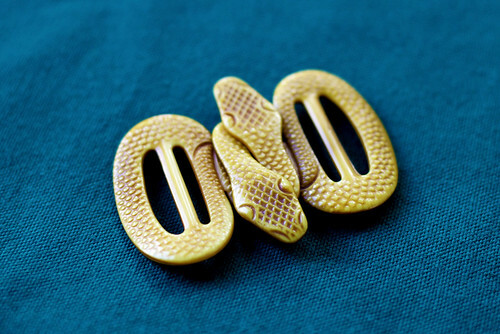 The snake buckle is fabulous. Well…not one of my favorite critters in the garden…but as a jewelry piece – how unique & so artistic! What a great find. Isn’t it kind of sad to think a generation or two in the future, a button box might be unheard of?? Our Mom’s and Grandma’s were so conscientious about saving things. Thanks so much for sharing some of those memories.